I love Bruce Lee quotes. And this one is particularly relevant to learning jazz guitar. There’s a problem I see over and over again when students try to learn jazz. Know all the theory? Check. Know all the scale patterns? Check. Know the discography of every major jazz player to grace this earth? Check. Can they bust out a great solo? Struggle to improvise. Struggle to hold a steady rhythm feel in their comping. Struggle with playing a non-clunky chord melody. They are too afraid to play their jazz guitar to anyone, because they know it’s not up to scratch. Just knowing, in Bruce Lee’s words, is not enough. You need to apply what you know (in the right way). You need to DO – not just know. 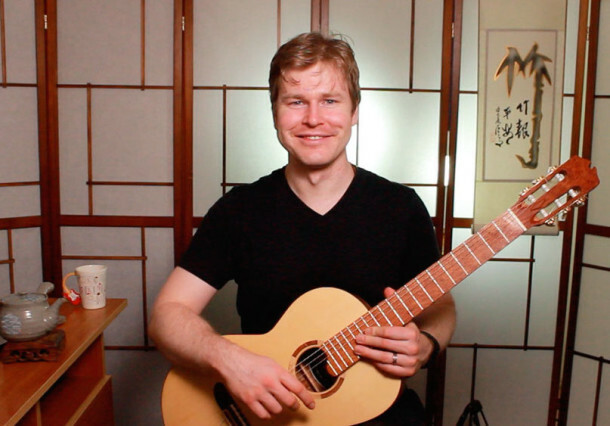 In my upcoming new program, the FretDojo Academy Club, you’ll definitely have plenty to DO so you can get your jazz playing to where you want it to be. Every single month in the Club will feature an all-new, complete end-to-end walkthrough on a classic jazz standard to add to your set list – with instruction on how to play it in a variety of playing situations (including solo guitar). You’ll never be caught out being asked to play something on the spot, and going into an internal panic, because someone heard you were a “jazz player”. Chord melody, single line improvisation, melody, comping – the works. (And just enough practical theory to help make sense of everything). You’ll have monthly goals for your practice, you’ll build your set list step by step, and you’ll also have the opportunity to get feedback on your playing by an expert.